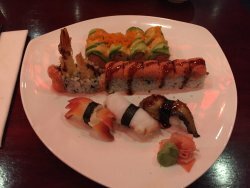 Really good sushi rollsHowever, we are yet to complain for getting extra sushi rolls or sashimi :)We enjoy sharing the shrimp and steak hibachi dinner, with an added salad and...I ordered crab spring rolls, Yum Yum salad and Captain America sushi. Beef & seaweed boiled for hours to get the broth, then added thin mushroom & onion. White meat shredded chicken boiled w/ coconut cream & asian herb. Shredded filet mignon, seaweed, egg & vegetables. Organic mixed greens w/ black bean vinaigrette, topped w/ ripe avocado. Crab meat, mango, cucumber & seaweed mixed w/ tempura flake & spicy mayonnaise. Very popular choice! Seared thinly sliced tuna w/ a ponzu sauce. Finely sliced yellowtail served w/ yuzu ponzu sauce. Pieces of chef's choice raw fish slices. Fine sliced white tuna, on a bed of shredded cucumber, sprinkled w/ ponzu sauce. Delicious & refreshing! Mixed green, shrimp, mango, herb, wrapped in rice paper, served cold w/ asian mild sweet dipping sauce. So refreshing! Sprinkle w/ sea salt, great in protein, best for your heart! Bar-b-q shira miso marinated eggplant, you won\x19t believe how good it tastes! Fresh yellowtail marinated in spicy mayonnaise & tempura flake. Crab meat, avocado, shitake mushroom, egg, & japanese pickle. Crab stick, cucumber & avocado, very popular roll. Minced fresh tuna/salmon marinated w/ spicy mayonnaise & tempura flake. Good choice to start out the sushi, they don't taste like raw! Shrimp tempura, spicy tuna, mango, & asparagus, wrapped in rice paper. It was very popular so we decided to put on the menu. 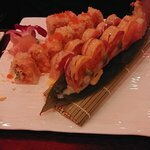 Spicy tuna,‏ spicy salmon, spicy yellowtail & avocado wrapped w/ soybean paper, topped w. eel sauce. Ultimate spicy combination! Spicy tuna, cucumber, & avocado wrapped in soybean paper, topped w. fresh tuna, spicy mayonnaise, tempura flake & tobiko, tuna lover's best choice! ! Crispy shrimp tempura. Topped w. eel & avocado. Gotta have it! 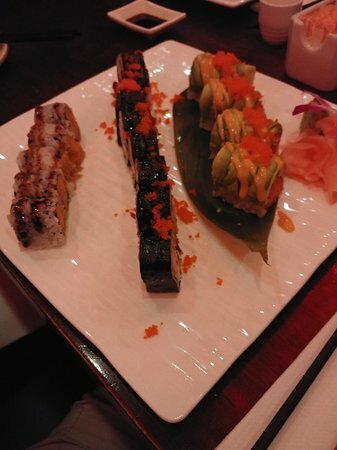 Deep fried white tuna, spicy tuna, avocado & mango. Wrapped in soy paper, topped w/ tobiko. Wish everyday is christmas! Shrimp tempura & asparagus. Topped w/ lobster salad, avocado &tobiko! Go patriot! 1 choice! Shrimp tempura inside, spicy tuna, & tempura flake on the top. Its back due to huge demanding, lobster tempura, spicy tuna, cucumber & avocado, wrapped in soybean paper. Ten pcs of sushi, fifteen pcs sashimi w. california & tuna roll. Pcs sushi & 36 pcs of sashimi 2. chef's choice special roll. Selected premium beef ribs, boiled in chef special sauce w/ celery, carrot, ginger it's so tender & so tasty. Crispy chunky chicken, sautéed in asian sweet & sour ginger sauce w. pepper & pineapple. 8oz grain fed mid-west filet beef in special mushroom sauce. Served w. baby corn, asparagus & mushroom. 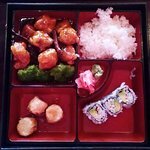 Lunch box includes miso soup, salad, shrimp shunmai, California roll. Shredded white meat chicken, stir fried w. pepper, fresh mango in asian sweet mild sauce. It's so popular so we decide to put on lunch menu too. Lowest on calories, tepanyaki style over w. teriyaki sauce. Grilled white‏ meat chicken & vegetables, topped w. teriyaki sauce. 1 chicken dish! 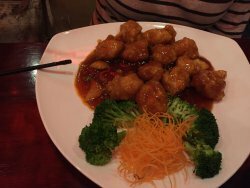 Crispy chunky chicken sauteed in asian sweet & sour ginger sauce. Served w. steam broccolis. Premium quality‏ strip steak, cooked w/ mushroom in oyster gravy. Japanese classic deep fried dish w. light & crunchy batter. Top quality strip steak or atlantic salmon, served w. vegetables & teriyaki sauce. Selected premium chicken breast, stir fried w/ garden vegetable in chef's mild brown sauce. 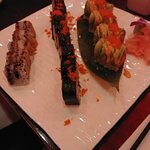 Very nice sushi....I will say that I find the sushi is much better when you dine in the restaurant ( presentation is beautiful). 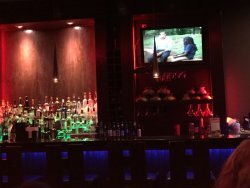 Great meals and good service. Got sick after eating. Tried to get money back. Manager was rude but did take the meal off the check. My son introduced me to this restaurant and I tried my first sushi roll and I have been in love with it ever since. 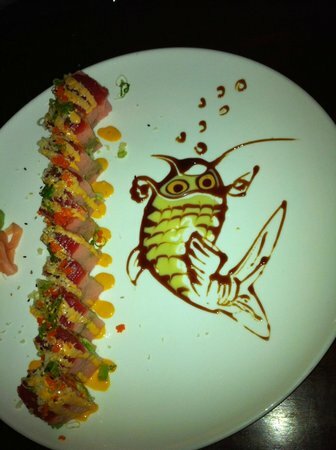 The last time I was there I got the Patriots roll it was beautifully presented including an edible flower. Ordered two sushi dishes and two entrees. Very good food. Sushi was mostly filling, not too much rice. I love going out to Kyoto. My fiance and I have such a great time every time. 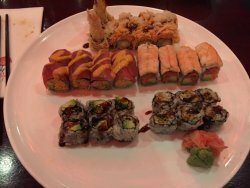 The food, drinks and service are always exceptional and they have become the only place I'll go in the area for sushi anymore. Loved the crispy duck spring rolls! 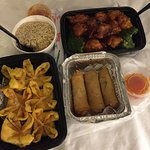 We also got the creamy crab Rangoon and general Taos chicken! Everything was delicious. 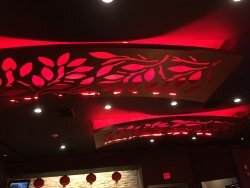 Get quick answers from Kyoto Japanese Steakhouse staff and past visitors.